Campbell’s first year in Mobile was a struggle, and now USA is starting over in all the wrong units. Sometimes the photo tool in our content management system tells a pretty clear story. Hey, Steve Campbell, how did your first year at South Alabama go? I can understand the looks of baffled frustration. 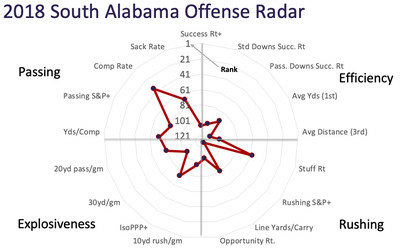 I probably looked similar when trying to pair up what I said about South Alabama in last year’s preview and what actually took shape on the field. That the product was bad wasn’t all that much of a surprise. When Campbell came from Central Arkansas to USA, it appeared he had a pretty significant culture change to enact. Sure enough, this was a Year Zero situation. The Jaguars fell from 4-8 and 106th in S&P+ to 3-9 and 117th. Campbell did a potentially fantastic job with his offensive coordinator hire, bringing in Troy co-OC Kenny Edenfield. The 52-year old had OC stints at Nicholls and North Alabama before landing in Troy in 2008. Edenfield’s presence suggests USA won’t have problems going with a pass-first, pass-second attack. We’ll see if passing game continuity can overcome a drastic ground game. Returning interesting pass personnel and unproven (to put it charitably) run personnel, with both an offensive coordinator and head coach used to throwing the ball a lot, USA ran the ball 67 percent of the time on standard downs (23rd-highest in FBS) and 39 percent on passing downs (34th). Mind you, they were terrible at running and pretty decent at passing, but they went run-heavy anyway. Campbell brought his UCA defensive coordinator, Greg Stewart, with him, and with good reason. UCA got after you. USA ranked only 102nd in havoc rate in 2017 but was a strong 31st in DB havoc rate. [...] This is a potentially loaded secondary. 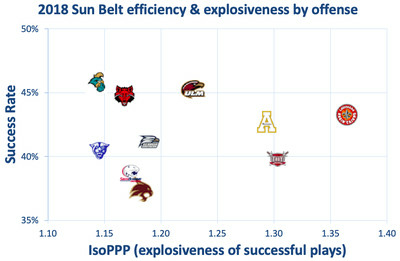 That’s generally a good thing to have in the Sun Belt. With a loaded secondary and unproven front six (one that was missing a projected starter all season due to injury), USA ... played okay run defense and some of the worst pass defense in the country. The Jags’ only source of havoc was the defensive line; the secondary was passive and overmatched. On both sides of the ball, USA should have advantages through the air and potential deficits on the ground. And there will be plenty of win opportunities if the strengths are maximized — S&P+ projects the Jags with seven games projected within one possession. USA played two games decided by one possession — a season-opening near-upset of Louisiana Tech and a season-closing win over Coastal Carolina. Average scoring margin of the other 10 games (including two wins): 26.3 points. So yeah, if you read last year’s preview, I apologize. It was a waste of everyone’s time. The Jags might not be any easier to predict this time around, not without either of their passers, five of the top seven in the receiving corps, and three starting safeties. They are light in all the areas that carry extra weight in the returning production formulas (QB, WR, and DB are more tied to year-to-year improvement and regression than other units) and are projected to stumble to 127th as a result. 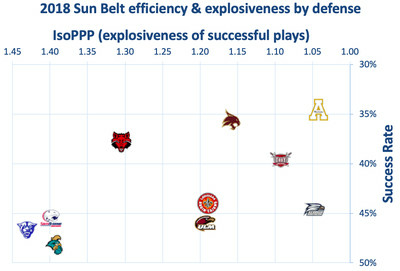 So uh, congrats in advance to 2019 Sun Belt champions South Alabama, I guess. 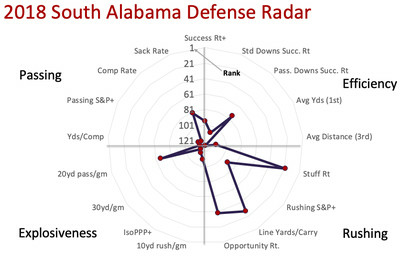 South Alabama’s 2018 strengths weren’t all that surprising; it was how much Edenfield elected to use those strengths that was. The Jags struggled every bit as much to run the ball in 2018 as they had in 2017, but they just kept doing it. Tra Minter, Deonta Moore, Maurice Mayo, and slot receiver Kawaan Baker combined to rush nearly 30 times per game while averaging a combined 4.1 yards per carry, and USA ranked 124th in Rushing S&P+. That meant that Evan Orth and, late in the season, Cole Garvin were constantly throwing on second- or third-and-long. And they still produced! USA was 53rd in Passing S&P+, and Orth completed over 65 percent of his passes! And they kept running the ball! I’m still confused. It doesn’t really matter now, though. Orth and Garvin are gone, as are leading receiver Jamarius Way and No. 3 man Jordan McCray (a grad transfer to UNLV). Moore and Mayo are, too, for that matter; aside from Minter and Baker, the people touching the ball this fall will be almost completely different. Baker’s return is important. He was easily the most efficient guy in the skill corps — he didn’t produce any big run plays, but his 46 percent rushing success rate was still the highest on the team, as was his 50 percent receiving success rate. He ended up with 59 rushes and 50 targets, and I’m curious if Edenfield continues to use him in such a diverse way if he’s also the No. 1 receiving target. And I guess that will depend on Malik Stanley and Jalen Tolbert. Stanley was USA’s No. 3 receiver in 2017 but missed a chunk of 2018 to suspension; he caught eight of 11 balls for 110 yards and a touchdown, though, and he could be ready for a breakthrough if he can stay on the field. Tolbert, meanwhile, has good size (6’3, 200), and while he caught only five passes last year, that makes him the No. 3 leading returning WR. You figure three-star JUCO Jamel Thomas and three-star redshirt freshman Mo Edwards Jr. will get extended looks in fall camp. You also figure Minter will get plenty of touches again. His 4.4 yards per carry and 37 percent success rate were pretty horrid last year, but they were improvements over 2017 (3.2 and 37 percent), and he’s a decent receiving option out of the backfield. And there aren’t any other experienced options — the backup will likely be either JUCO transfer Terrion Avery or one of four redshirt freshmen. The line will be a strength, at least. USA was 59th in stuff rate (run stops at or behind the line) and 70th in sack rate, which aren’t amazing numbers but are solid compared to most of USA’s other stats. And of the six linemen to start at least six games last year, four are back, including senior left tackle Troy Thingstad. Throw in two JUCOs and maybe one or two from a batch of seven redshirt freshmen — one thing you have to give Campbell: he did not panic and start burning redshirts last year — and you’ve probably got a solid unit. Morton had two distinctly different seasons at Hinds Community College. As a freshman in 2017, he completed 59 percent of his passes while making mostly safe throws (12.6 yards per completion, 2.8 percent INT rate); in 2018, he got aggressive, running the ball more and averaging 13.2 yards per completion but with a 50 percent completion rate and a far-too-high 5.1 percent INT rate. If he’s asked to throw as much as Orth and Garvin on second- or third-and-long, it might be a pretty all-or-nothing experience. The 2018 USA pass defense was surprisingly bad and loses maybe its three best players. The 2018 run defense was surprisingly decent and returns most of the reasons why. Because the Jags were pretty constantly getting roughed up on the scoreboard, opponents spent a lot of time running the ball, but to the extent that that matters, that would be playing to their strengths again in 2019. Tackle Tyree Turner is hands down the best returning player on the defense. The 285-pound senior from Stockbridge, Ga., led the team with 10 tackles for loss and 18 run stuffs and was second in sacks with four. The line featured a mostly rotating cast of characters, but he was a constant, and he could have another big year, and his dance partner in the middle of the line, 300-pound nose Jordon Beaton, is pretty solid, too. The competition will be strong at DE. Taji Stewart and Jeremiah Littles combined for 7.5 TFLs and will try to hold off some interesting youngsters like Jalon Sheffield, plus a couple of players returning from injury: DE/OLB Riley Cole missed most of 2018 with a leg injury, and former Missouri end Rocel McWilliams missed all of the season with an Achilles tear. The linebacking corps loses leading tackler Bull Barge, but sophomore Nick Mobley might have been the better all-around player, and senior Roy Yancey also returns after missing 11 of 12 games with a leg injury. The front six was decent despite loads of injuries and should be pretty good healthy. It better be because the secondary’s starting over. Gone are safeties Tobias Moss, Nigel Lawrence, and Malcolm Buggs, and back are corners like Jalen Thompson and Gus Nave, who struggled for most of the season. That Campbell signed three JUCO transfers (including three-star safety Patrick Rosette) and converted WR Tyrone Legette to cornerback probably tells you what you need to know here. Maybe the new blood will work out well; it often does not. This unit gets a reset as well. Tra Minter is strong in kick returns, but two solid legs — punter Corliss Waltman and kicker Gavin Patterson — are gone. Returnee Frankie Onate took part in kickoffs in 2017 and appears to have a strong leg but hasn’t attempted a collegiate field goal yet. That makes this unit pretty hard to project. There’s a chance that new blood in the form of JUCO transfers at QB, WR, and DB all take immediately, and South Alabama’s lineup stabilizes. It doesn’t usually work out that way, though, and on paper, 2019 looks like a second transition year for Campbell. The only reassurance I have for Jags fans is that S&P+ was pretty wrong about their team last year. If it’s not in 2019, it’s going to be a long season. 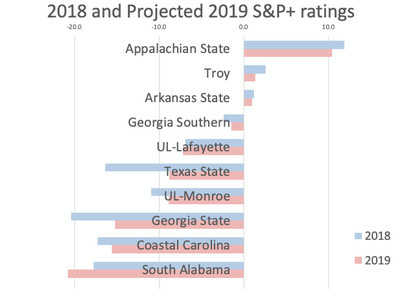 USA is projected 127th overall — 109th on offense, 126th on defense — and even with a Sun Belt schedule and a non-conference game against Jackson State, the Jaguars are projected to win an average of just 2.6 games. Campbell, still only 52, has won big at three different levels of the sport: Division II (he won the 2000 national title at Delta State), JUCO (he shared the 2007 national title at Mississippi Gulf Coast), and FCS (he went 20-5 in his last two years at UCA). Odds are in his favor, then, that he’ll eventually figure things out in Mobile. But his first season was a wash, and he doesn’t yet have the roster balance where he needs it to succeed. In 2020, the roster will be more stable in that regard, but he could also be replacing almost his entire defensive line. So yeah, this is going to be a long-term build. Here’s to hoping that the next round of surprises are happier than the last round.